It was revealed yesterday that numerous test centres have been caught rigging health and safety exams, enabling workers lacking English to obtain qualifications needed for a CSCS card. If you work in the Construction industry, you will be well aware of CSCS cards. Especially now that they are mandatory for anybody working on a construction site. If you are experienced within the construction industry, then you could do your bit to ensure that every worker on site receives quality training. Whether you are involved with the vocational training of employees so that they can get their gold CSCS card or taking them through their level 1 health and safety training, you should hold the relevant assessor qualification. 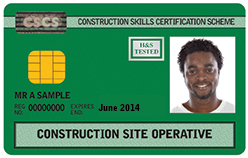 As of the 1st of July last year, the old Green CSCS cards are no longer being issued. It was said that it was too easy to get a green CSCS card, which resulted in incompetent construction site operatives working in a dangerous role without holding the relevant qualifications. Which probably explains the rapid increase in CSCS fraud over the recent years as well; there were 96 reports in 2012, some 264 in 2013 – and 311 last year. However we have had a huge increase in Construction site workers train to become in-house NVQ assessors with us over the last year. It’s clear that there are more and more companies that are now looking to tighten up on the training that their workforce receives. And what better way to do that, than to train up experienced members of staff to become in-house assessors? The benefits of training up in-house assessors are two-fold for construction companies; not only can they clamp down on the training being delivered to their employees and ensure that they have a highly qualified workforce, but they can also cut down on training costs, as they won’t need to pay external training providers to come in and deliver the training. We have trained in-house assessors for over 10 different construction companies already this year. If you would like to find out more about what in-house NVQ assessors could do for your company, or if you yourself are looking at doing the course to assess construction workers on-site, then please get in touch. You can either request a callback by submitting your details below and we will call you within 1 working day, or call us on 01205 805 155. Please provide your contact details below and a dedicated member of our team will call you within one working day. Where Do I Begin With Setting Up A Training Company?